Andy Larsen: The NBA wants you to get to know its referees. Its new officials media guide tells all. 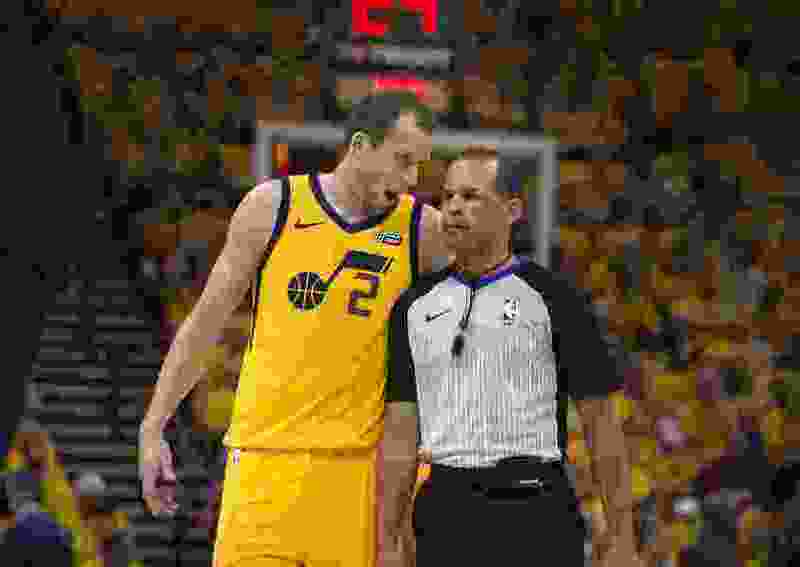 (Scott Sommerdorf | The Salt Lake Tribune) Utah Jazz forward Joe Ingles (2) talks to a referee after a first quarter foul. The Thunder led the Jazz 22-18 at the end of the 1st quarter during Game 6 of the first round playoff game, Friday, April 27, 2018. They say you know a game’s referees have done a good job when they stay completely anonymous. But the existence of the NBA Officials Media Guide, released annually before the season, suggests otherwise. It seems that the league wants us to know its officials by something other than the curse words that colloquially proceed their name. What do we learn about the men — and one woman, Lauren Holtkamp — who wear the stripes? We learn that the most frequently requested meal at referee get-togethers is steak: 16 referees chose it as their favorite. In second place came lasagna, and maybe that shouldn’t be a surprise: 13 referees selected either Rome or Italy as their destination of choice. Seven referees would like to go to Africa, whereas four might like to visit Joe Ingles and Dante Exum in Australia. Not everyone wanted to travel so far; referee Michael Smith just wants to visit the White House the next time he’s working a Wizards game in DC. Bennie Adams, a former math teacher with a master’s degree in the field, doesn’t have a specific destination in mind, just “a remote tropical island with wifi for only 1 hour daily.” Going there is the top item on his bucket list. • The NBA announced that the G-League will begin to offer “select” $125K contracts to players over 18 who wish to play professional basketball stateside, but are ineligible to play in the NBA (usually because they’re not yet 19, the NBA’s age limit.) We’ll see how many elite high school recruits choose to take the above-board money — and NBA coaching — over going to big-name college schools. • The New Orleans Pelicans have gotten off to an excellent start to the season, thanks especially to their frontcourt. You know Anthony Davis, and he’s an absolute monster. He had a 32 point, 16 rebound, eight assist, three block, three steal performance in an 19-point win against the Houston Rockets. But it’s Nikola Mirotic who’s started the season even more hot: scoring 30 points in the Houston game and then 36 points on 14-21 shooting against Sacramento. They’re a team to watch out for. • The 76ers have started the season 1-1, with an ugly loss against the Celtics and a win against the hapless Bulls. But the real interesting move they’ve made is inserting 2017 No. 1 pick Markelle Fultz into the starting lineup, ahead of accomplished sharpshooter J.J. Redick. The logic is that Fultz is the future, but the Ben Simmons, Redick, Robert Covington, Dario Saric, Joel Embiid lineup outscored opponents by 21 points per 100 possessions in over 600 minutes on the floor last year, and they’ve chosen to break it up. Meanwhile, Fultz hit the first three of his NBA career against Chicago, to supportive and somewhat ironic cheers from the Philly faithful. That’s a bit of a trend too: referees aren’t the world’s biggest fans of the Internet, and in particular, what they find online if they start searching their names on social media. Of the 65 officials surveyed, only three chose Instagram and two chose Twitter as their favorite social media apps — none chose Facebook. Instead, the top selection was Netflix (the favorite movie: The Shawshank Redemption, with the Godfather movies and Coming To America counted as runners-up) and in second place came the NBA app, staying connected to the league they cover. Hilariously, Marc Davis chose his VPN app, Cisco AnyConnect, as his favorite in the universe of millions of apps. For some refs, officiating is a family affair. James Capers, JB DeRosa (just 27 years old), Brian Forte and Ron Garretson are the sons of former long-time NBA whistle-blowers. Jacyn and John Goble are brothers. Jonathan Sterling is married to the league’s only female ref, Holtkamp, who will miss this season due to knee surgery. Perhaps wisely, over a third of referees declined to put an answer in the “hidden talent” section, at least one that the media guide was happy to print. The most frequently answered talent was “cooking” — five referees indicated they had culinary talent — but four said they were great dancers. Two, Gediminas Petraitis (ballroom) and Sterling (breakdance) had dancing specialties. Three referees are jugglers: Jason Phillips, Dedric Taylor, and J.T. Orr. Marat Kogut is a magician. Some talents aren’t so physical: Rodney Mott loves interior design, and Scott Twardoski loves “landscape astrophotography.” He also lists “photographing hot air balloon festivals around the world” as his No. 1 bucket list item. There are some local ties, too. Gary Zielinski, who will miss this season due to injury, is a graduate of Kearns High School and the College of Eastern Utah. He now resides in Magna. Four referees chose games involving the Jazz as their most memorable games ever: Kevin Scott chose the Jazz/Hawks four-overtime game in 2012, Tre Maddox’s most memorable game was his first, a double-overtime affair between the Jazz and Clippers in 2010. Tyler Ford’s most memorable was just a close regular-season contest between the Jazz and Warriors in 2015, Haywoode Workman’s was Kobe Bryant’s final game in 2016. Speaking of Workman, he actually played in the NBA, spending eight seasons in the league with five different teams. Leon Wood spent six years in the league, playing for six different clubs. Curtis Blair was drafted by the Rockets in 1992. But they’re not the only officials with interesting past employment: Leroy Richardson was an enlisted surface warfare specialist and underwater sea surveillance specialist for the military. Dedric Taylor’s past was more mundane: he was a full-time UPS driver for 13 years. So next time you’re looking to call NBA referees some names — unless you’re calling Derek Richardson “Chopper” or Mike Callahan “Duke,” their preferred nicknames — just remember this: they’re interesting people too.